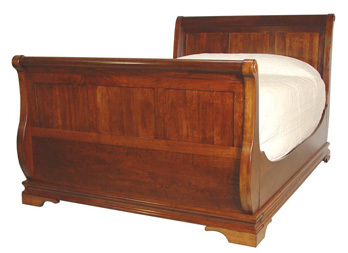 Part of the Heirloom Sleigh Collection, this attractive sleigh bed features both a high headboard and high footboard and is available in all sizes. Like all of our Amish furniture, this sturdy bed is built to last and crafted with the fine attention to detail the Amish are famous for. Shown in solid cherry, but also available in solid oak, quarter-sawn white oak, hickory, maple and elm. Prices will be shown for solid oak; Please contact us for pricing in other woods.